Hello! I hope everybody is staying warm. 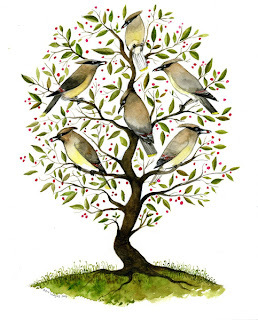 I finally received my new edition of archival inkjet prints of the watercolor I did awhile back: Cedar Waxwings. I just posted it in my Etsy shop. I'll be back a little bit later in the week with some new paintings. Wow, Diana! This is really amazing. I like that it's formally perfect but still retains a very personal atmosphere and touch. Style master! I really love this painting ... well done!